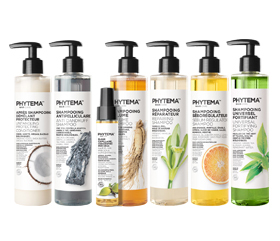 Phytema™ Laboratoires presents Positiv’hair™, a range of natural products to restore the pigments to white and grey hair. Its active ingredient penetrates to the core of the hair to gradually and naturally restore colour to the hair fibre. Why does the hair loses its color? Our hair has colour because it contains melanin, the same pigment that is found in our skin. With age, the cells responsible for producing melanin secrete less and less of it, and finally stop entirely. Hair, when there is nothing left inside it to give it colour, turns grey or white. How is Positiv’hair™ different to conventional colouring techniques? Positiv’hair™ is a natural repigmentation treatment. With repeated application, it allows you to gradually restore colour to grey and salt-and-pepper hair. 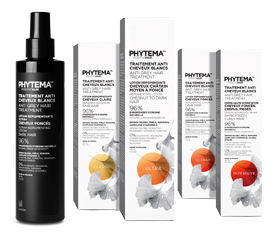 The active ingredient penetrates to the core of the hair and produces colour as a reaction to sunlight and air, unlike dyes that coat the hair with a pigment that you can see. The procedure for using Positiv’hair™ also differs from that of dyes. There is an initial treatment enabling you to achieve the desired colour, followed by a subsequent maintenance treatment to retain this colour.